SMG7 is a protein involved in nonsense-mediated mRNA decay (NMD). It interacts with phosphorylated UPF1, recruiting decay enzymes on target mRNAs. Previous reports showed that its depletion affects only a very limited number of transcripts. SMG6 is instead responsible of the most common degradation route. We performed RNA-seq in HeLa cells with simultaneous knockdowns of SMG6 and SMG7 while restoring the expression of either gene. We could thus show that SMG7 can almost completely compensate for SMG6 absence, indicating a high redundancy of the two routes. This work was carried out in the group of Prof. Oliver Mühlemann. "Transcriptome-wide identification of NMD-targeted human mRNAs reveals extensive redundancy between SMG6- and SMG7-mediated degradation pathways"
RNA, 2017, 23(2), 189-201; doi:10.1261/rna.059055.116. "Nonsense-mediated mRNA decay: novel mechanistic insights and biological impact"
WIREs RNA, 2016, 7(5), 661-682; doi:10.1002/wrna.1357. 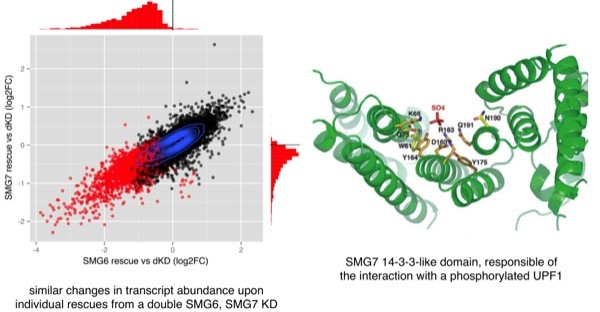 "SMG7 is a 14-3-3-like adaptor in the nonsense-mediated mRNA decay pathway"
Mol. Cell, 2005, 17(4), 537-547; doi:10.1016/j.molcel.2005.01.010.